Not long ago I had the pleasure of watching a rising star in the dog training world, Chirag Patel. There were a number of things I loved about his presentation, but I kept thinking about one in particular: The importance of knowing when your dog needs a brief break during a training session. This is not something that we humans are hard-wired to do. After all, we–the trainers–are fine, being the ones who know the goal of the exercise. We’re cruising along giving positive reinforcement boom boom, boom, one right after the other. It’s all positive, right? Well, no it’s not. No matter how many pieces of chicken can go down a dog’s eager throat, it can be exhausting to learn something new, especially when one doesn’t know the goal. It is easy to forget how stressful learning anything new can be. That is true even for us when we know what we are striving for. Dog do not. They are also trying to learn something new in a foreign language, which must be a bit like listening to a podcast on how to solve quadratic equations through the scratchy sound of static. This is why my favorite game in dog training classes is having Person A teach Person B an action using nothing but a clicker, when Person B has no idea what behavior s/he is supposed to perform. (Thank you Karen Pryor!) Person B inevitably reports that the process is tiring and frustrating and stressful. And yes, yes, I know, really I do–that learning can be great fun, and many dogs love training sessions and are eager to play. Mine certainly are. But still, that doesn’t mean that dogs shouldn’t be allowed to learn at their own pace. 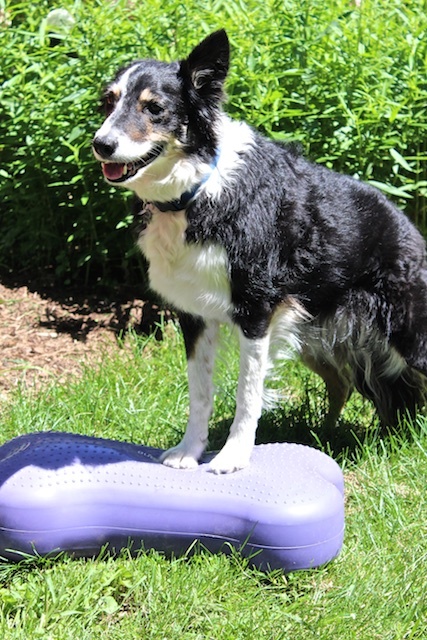 Example: I’ve been working Maggie on a Fitbone to strengthen her back legs. She followed me to our first session eagerly, eyes on the treat pouch, ostensibly thrilled to get special time with me along with dried liver bits. Training went smoothly, all simple and according to plan: Paw touched Fitbone, mark/treat. Weight shifted onto paw on Fitbone, mark/treat. We continue for a few more trials, both feet on the Fitbone now, when she turned her head and became fascinated, absolutely riveted, on a previously ignored and invisible spot on the floor. Sniff, sniff, sniff, as if a veritable encyclopedia of olfactory information had arisen from the ground out of nowhere. It would have been easy to smooch to get her attention back, (my first inclination). However, remembering the importance of letting the student call the shots, I stayed quiet and let her sniff. As I waited, I remember all the trainers at Natural Encounters, who let each parrot decide when it wanted to train and when it didn’t. The trainers might make one or two attempts to re-interest the bird with a different treat or a different task if the student lost interest, but if it didn’t work they simply stopped the session. Most importantly, I never heard one word of frustration or discontent about it. It’s the parrot’s call when to end the session, not yours. Period. Channeling that philosophy and Chiraq’s wise words, I simply sat and waited until Maggie turned and looked back in my direction. I gave her a prompt, and boom, her two paws punched onto the Fitbone, her weight shifted forward just as I wanted. I worked on disappearing the prompt, reinforced like crazy for several more trials, and then ended the session. Here’s another example from this weekend in Northern Wisconsin. 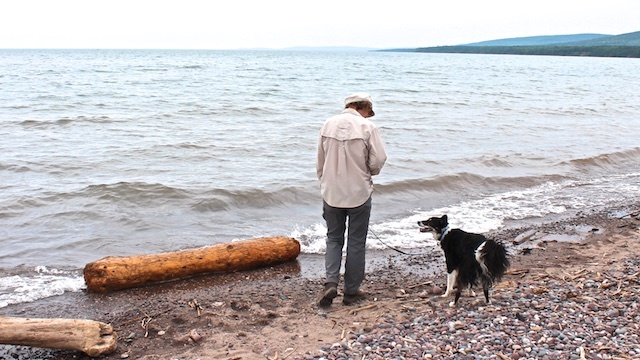 We took a walk on the shore of Lake Superior, where small waves lapped at the water’s edge. Maggie, to my knowledge, has never seen a large body of water, much less one with waves. Even tiny ones. I walked her down to the water and she assumed the classic “scared but curious” stance of a nervous dog. You can’t miss it in the photo below–weight shifted backward, mouth closed and tight–but riveted on this strange, new phenomenon. 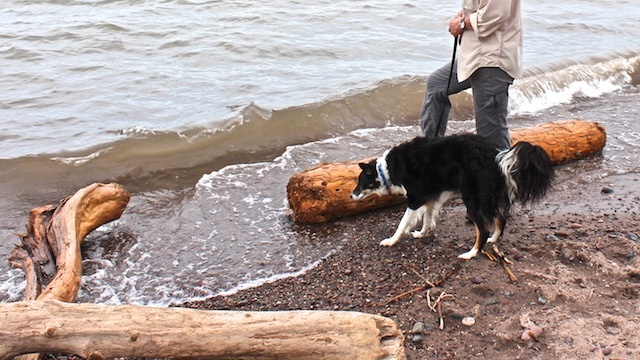 After looking at me, looking right, looking left, sniffing the air, the sand, the pebbles, and who knows what else, Maggie decided the waves needed more investigating. So back we went and in just a few minutes she decided the waves weren’t anything to worry about at all. If I’d forced the issue, I suspect that things would have gone differently. However, I was aware that it took a conscious decision on my part to let Maggie drive the lesson’s schedule. Not that I, as a dog trainer, ever want to be in control or anything. It takes patience to let the student run the show, something that is often in short supply in our species. (I say that only theoretically, of course.) But it’s important, truly important. I would love to hear your stories of “the pause that refreshes”–how it’s worked for you, not worked, forgotten about and then relearned… You name it, we’ll all learn by reading about it. MEANWHILE, back on the farm. 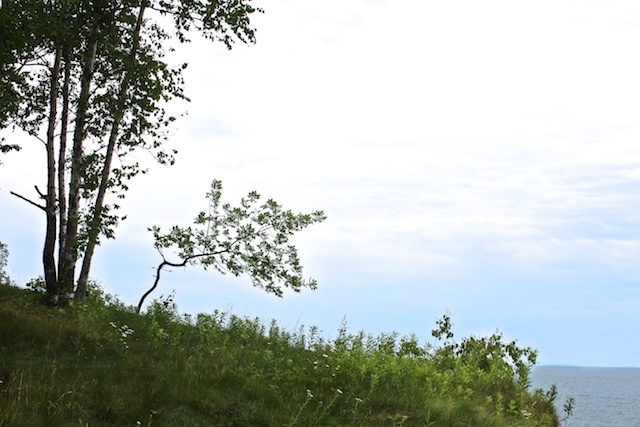 Good to be home, but our short trip to Mercer, WI was heavenly. First off, the library in Mercer is gorgeous, welcoming, and chock full of great resources. About 65 people came to my talk on The Education of Will, and they were a great audience. I’m loving my “Year of the Library”; I’ve met such wonderful people. And I get to be surrounded by books while I’m talking. Heaven. 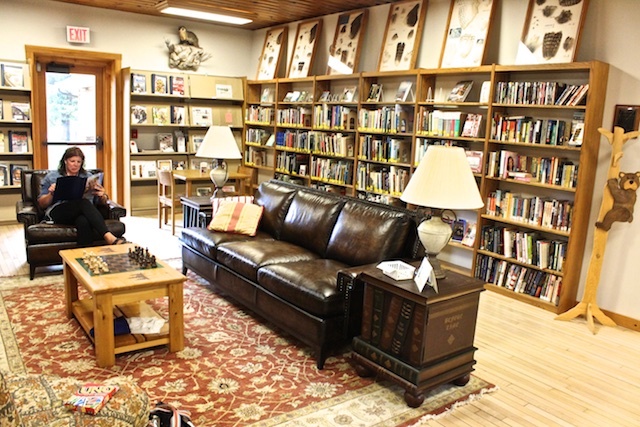 How many libraries have such a cozy reading room? I could spend hours in here. 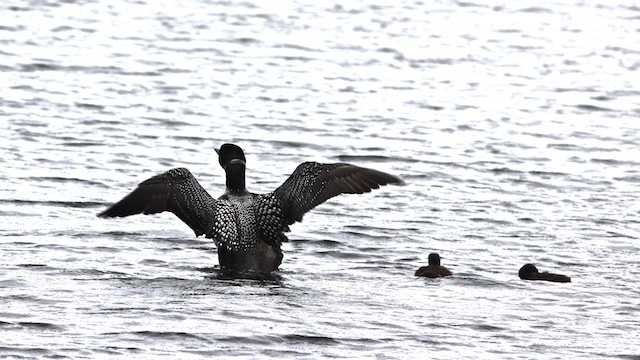 One of the best parts of the trip were the visits from a family of loons, one of my favorite birds of all time. We didn’t get any great photos, the light was low and it was raining when they were beside our dock, but still…. Here’s a peaceful view of Lake Superior, or, Gitchi Gami in Ojibwe. Next week we take all the dogs to northern Minnesota, where I speak at the Virginia Public Library on Tuesday July 24th. Can’t wait. I’ll write more soon about traveling with the dogs… in some ways the most fun has been Tootsie, who I swear has begun singing “On the Road Again”. Occasionally, while doing scent work, a dog will stop moving and smell intensely at one spot. I tell students not to interfere; some of a dog’s best problem solving occurs just after this point. It’s definitely NOT “dinking” around–you can tell when a dog is hot on the trail of a mouse or whatever and needs a little redirection–it’s incredibly still and focused, and should be respected. I say respect it because, when someone scolds a dog at this point, during the intensely focused sniff, I see a real decline in focus, interest, and confidence. It’s not always even a break, although I agree that it often is. At least in scent, I believe the long sniff is the equivalent of what we do when faced with something tricky: we stop, reassess, and consider options. If someone yanked on us each time we paused to think something over, I think we’d want to quit too. We try to push through, when we’d be better off in the long run to quit for a bit and go for a walk. I stumbled across a Chirag Patel post on FB several years ago and have been a huge fan ever since. Great post! I’m printing it to remind myself of your good points! Thanks! Sometimes when a dogs disengages/ zones out during training, I leave them to their own devices/self soothing behaviours, and sometimes I ask them to do their favourite ‘trick’ a couple of times to re-set the dial or boost reengagement. I’m not sure how I decide which strategy to use — I’m pondering it now thanks to your post! Any thoughts on the pros and cons? I find more fearful dogs need way more breaks, and they’ve made me more aware of how other more confident dogs might express the need for a break in more subtle ways that I previously missed. My 5 year old Great Pyrenees, Bella, is taking her first 6-week group training class to prepare for the CGC test. The class takes place in the evening at an indoor facility with 7 other dogs and their handlers, an excellent instructor, and an assistant. The class lasts for 1 hour. Bella is a confident, mature girl but she just can’t focus for an entire hour in that kind of high intensity and distraction. At about 35 minutes into the first and the third class, she had enough and began to gently insistently pull toward the middle of the room, as if to say that she would like to walk to visit the other dogs and people or just plain move outside of her spot, thank you very much. She was showing signs both of excitement and stress, losing interest in chicken and even a peanut butter filled bone, and not able to just settle down and take a quiet break. It’s hard to know what to do in that setting! It’s really hard for most people to give their dogs a break when they are “supposed to be working”. If a dog gets sniffy during class I tell the student: “He just needs a mental break. Stand quietly in one spot and let him sniff. We’re not going to beg for his attention! When he’s done sniffing he’ll look at you and then you can reward that.” Putting it that way seems to help. You know, I can’t focus well for much longer than 50 minutes myself. (Classically conditioned by classes in college?) If I were you, I would take Bella away from the class for a five minute break before she starts to fuss. Definitely alert the trainer why you are doing it… maybe s/he will decide to make a break part of the class curriculum. That would be even better! Great question about whether to ask for fun tricks to ‘re engage’ or just let the dog cruise on its own for awhile. I’m guessing it depends on the dog and a gazillion other factors. Maybe we should all experiment a bit… try each on our dogs and pay attention to what seems to work best, and when? Our behaviorist has tried to reinforce this with us. I’ve gotten much better at just waiting it out because when our dog checks back in she is more engaged. Must be something to see! I’ve lived on both coasts and experienced the oceans but never been to Great Lakes. This article will give me more patience with my Sniffing Shih Tzu! Something I learned as a young music student was not to practice mistakes! If a session is just not coming together, take a break or call it a day. It’s amazing how much better something sounds the next day. The same applies to the dogs; first give them a break, but if they’re still not getting it they’re done with that exercise for now. Agree with you and Erin James. My local, very good trainer (never anything but a flat collar in her classes) was exasperated by my nonchalance towards a proper heel. I have hounds. My walks are more for time to sniff and explore than train. Everyone knows sit, leave it, wait, etc., but I need to give them time to be hounds with incredible noses. Cont to love your column. Will look up Patel. I really appreciate you calling attention to this. While I enjoy this game, I think it too often gets held up as an example of stress-free learning, because there are no aversives (which would obviously add stress). But whenever I’ve played it, I’ve felt immensely frustrated, and even if someone had offered me $100 for every step toward the right answer, I still would have been annoyed – just well-paid. That’s not to say that frustration is the worst thing, and a little bit of it is fine. I just think it’s important for people to recognize that skilled training involves being perceptive of this kind of stress as well. There is a plethora of good articles on ‘spaced learning’ on both Google and Google Scholar. Try this for readable coverage, https://www.sciencedaily.com/releases/2008/11/081118141708.htm or go to Google Scholar and type in “spacing of learning sessions”. Thanks for the good advice as I embark on a new round of classes . Maybe we’ll do better this time if I pay more attention to Jax & take more breaks. Hi Thanks for sharing! I remember my beloved Bambam when he still with us, I got someone who will train him and he so smart because he loves learning new tricks. After grieving to his loss I got a new buddy now and I’m so happy because I can apply this one. And also I want to say thank you pet cremation dallas for helping us. I know this from when I had a horse. If she saw something strange, like a big blue tractor parked next to the dirt road we were on, she’d stop. I’d just let her take her time to check it out and then she was calm and ready to move on, there was no anxiety and fear behavior. Confession: I do most of my dog training, especially trick stuff, in the bathroom as I live alone and of course the dogs follow me in there. I have a bowl of treats and we have a 2 or 3 minute training session while I’m in the “sit” position. When we stop they are eager for more. When my Tibetan Mastiff starts to lose interest in our training class, usually about 3/4 of the way through, I take him outside for a potty break. Sometimes he goes, sometimes just sniffs around. It’s his way of ‘taking a break’. once back inside, he’s happy to do the weird stuff Mom asks him to do. I have learned in nosework, when it seems that my dog is not working at all, is visiting people or the grassy areas, very often she is looking for clues. She will often stand still for a moment, nose lifted into the wind, turn and nail the location of a hide. It happens often, and I am learning (finally! heavens be!) to stand still, not talk, and let her work it out. Things go SO much better when I do, even in “regular” dog training episodes. Our biggest break through in agility came when she ran off and left me to look out windows (she loves windows! these were BIG ones!) and I stood still & didn’t say anything. When she came back on a run to me, big praise, and the best agility run we had ever had. Big time learning experience for both of us…. I always tell my students when a dog sniffs, stares out into space, stops for the “imaginary” scratch, etc., that they don’t quite get what we are doing and they are stopping to “be a dog” because that’s what they know best, that it give the computer a chance to reboot before recalculating the problem. We give them a minute to regroup then redirect, and ask again or make the exercise a little easier for that dog. I love the concept of a mental pause and waiting for the dog to come back. When I work with shelter dogs who have concerns about things like novelty, other dogs, or people, giving them a break to run or sniff is often essential to making any progress at all. Thank-you for bringing attention to this often overlooked point. I agree that we should do this for ourselves more often too! I love reading about one of my heroes/mentors doing something that I’ve been doing instinctively for years, but have gotten slack for by more experienced trainers for doing. I’m almost in tears with gratitude to you for this reinforcement! “Toilet training” is both brilliant and hysterically funny. You made my day! Years ago I observed in my Manners classes how stressed dogs became while learning new stuff (while eating lots of fajita chicken for treats). Their owners were always surprised when I pointed out the retracted commissures, tensions around the eyes and shallow panting after half an hour. “But they’re getting rewarded for everything!” they protested. My response was “Learning new stuff is hard.” We always gave the dogs breaks during the training session to reduce this inevitable buildup of stress. I also teach a BAT (Behavior Adjustment Training) class for reactive dogs. Over time I noticed that once the dogs learned that they were free to make choices and experienced the resulting life rewards, they began to add one more really great choice to their list – self-directed time outs where the dogs simply leave the area and explore other things in the environment. Through the BAT process, dogs are learning to communicate, “I’ve had enough for now, thank you.” We, in turn, have learned to honor and celebrate these decisions that represent (1) the acquisition of a great skill (leaving the scary thing when they need more space) and (2) fabulous communication between the dog and his owner. Great instincts LaurieAnn, keep listening to them! Just a follow-up on our Great Pyrenees, Bella! Thank you so much for your response as well as the suggestions of your other readers. A key seems to be to step in with a break BEFORE she loses focus and gets stressed out. That has worked well. I also took the advice of some of your other readers by taking a few moments to go “off curriculum” and play some games that she loves and finds easy while the trainer was working with other dogs in class who were having some trouble. Also, last week, when one additional exercise was suggested for the last 5 minutes of our intensive 60-minute class, I “opted out”–so Bella and I just enjoyed watching the other dogs do the last bit while I gave her belly rubs and chicken meatballs. My trainer was totally supportive and gave me some praise for being “a good advocate” for my dog. All around a great success. Thank you!